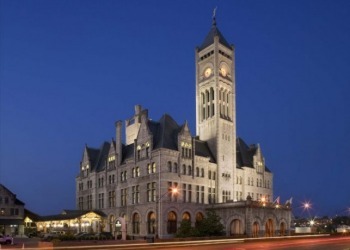 Union Station Hotel offers a choice of classic or premium rooms along with spacious guest suites. 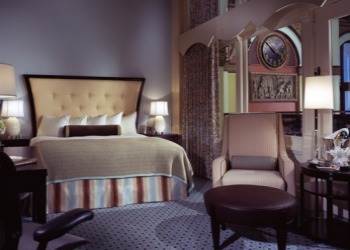 All of our guest rooms have been dramatically renovated and are spacious and luxurious. Features include an upscale state-of-the-art design with a warm residential feel and personal work space complete with contemporary technology and LCD flat screen televisions. Each bedroom provides one double bed, one king bed or two double beds with plush triple sheeting and duvets, while most rooms have soaring ceilings, large windows and a sitting area. Enjoy new marble bathrooms with steeping tubs or walk-in showers and expansive marble vanities. Union Station offers timeless Nashville accommodations, invoking the grandeur of the Victorian Age. This was an era when travel was something special - when you donned your "Sunday Best" for an exotic adventure to a new city. Rediscover this thrill with our awe-inspiring architecture, soaring arches, and intricate stained-glass windows. 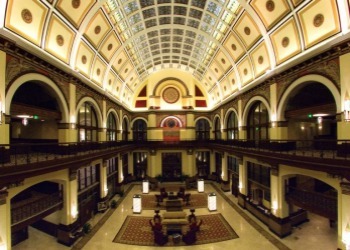 Formerly a railroad station, exquisitely restored in 1998, our majestic hotel features a 65-foot barrel-vaulted ceiling of 100-year-old, Tiffany-style stained glass, gold-leaf medallions, and rare bas-relief sculptures. Enjoy turn-of-the-century elegance and modern comfort in these spacious downtown Nashville Tennessee accommodations. 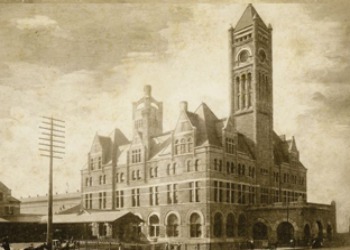 Long before it was a historic hotel, Nashville, TN Union Station was a key center in America's economy and culture. Opening on Oct. 9, 1900, to great fanfare, the building's imposing Gothic design - featuring lofty turrets and towers - was a testament to U.S. ingenuity and energy. During railroading's glory years, the station saw characters such as movie starlet Mae West and Mafia kingpin Al Capone - who was escorted through here on his way to Georgia penitentiary.